This entry was posted in Uncategorized on October 3, 2017 by Silver Willow. Wow! That really does say it all. I don't understand why the average person needs an automatic or even semi-automatic weapon. I just watched Jimmy Kimmel and he said it all (and cried). Guns for self defence sure (still don't agree with that though) but owning weapons of war? These automatic weapons are for only one purpose and that's not self defence. 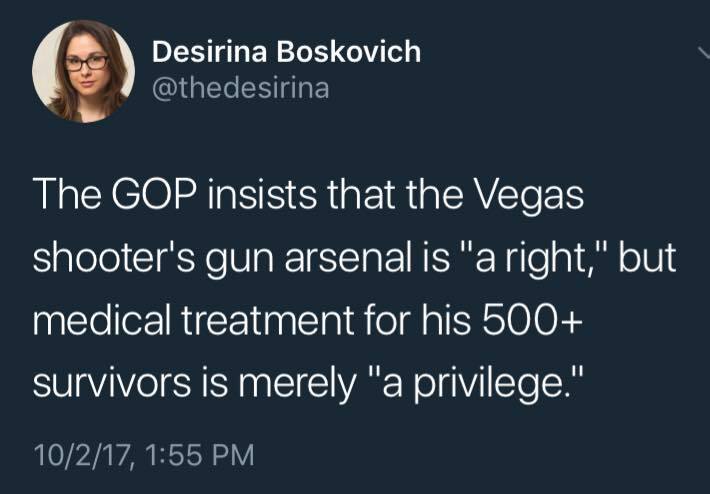 As for it being a “privilege” to receive medical treatment? What utter rubbish. It's a human right. the real answer; they DON'T. too bad it wasn't realized sooner. Automatic weapons made before 1986 are still legal; newer ones are not, and yet, you can buy the PARTS to turn a rifle into an automatic, which is all kinds of screwed up. This country is so screwed up right now. It's sickening. “If 58 people have to die so that we may enjoy the freedom to own 35 guns – the killer had at least that many – that is a sacrifice white America is prepared to make. YOU are a sacrifice they are prepared to make. You don't matter. Nothing matters except Larry Limpdick's need to feel tough or manly or important or strong or ready for the Race War he and everyone else in the comments section of the Milwaukee Journal-Sentinel is certain is coming because BLM or campus libtards or something. We have so thoroughly normalized a completely demented, paranoid, conspiratorial, afactual right-wing worldview that a man can buy 35 guns and not only are there no meaningful obstacles to doing so but the fact isn't even considered especially noteworthy or out of the ordinary. The very fact that we live in a society where a person can announce that they own 10 or 25 or 50 or 100 guns and the overwhelming, immediate response is not “What in the living hell is wrong with you?” followed by a psych evaluation… is the definitive proof that this will keep happening over and over and over again. my state has open carry. even for college students. who often aren't even 21 yet. our state congress was/is QUIETLY passing a bill to allow silencers on guns and rifles because the “hunters” are concerned about protecting their EARS. it wasn't put to a peoples vote of course. that means silencers on guns would legally be allowed now in our state. as in they wouldn't have been able to detect where the shooting was even coming from in this latest massacre. the WHOLE thing is beyond belief anymore. and the desirina quote is spot on.